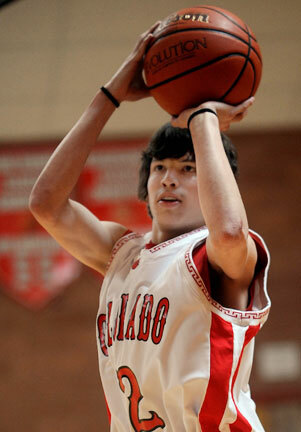 In April 2011, Dominic Lopez, a senior at Colrado School for the Deaf and the Blind, became the first Deaf student selected for the state's All-Star basketball games at the Pepsi Center. During his four years on CSDB 's varsity team, the Bulldogs, he compiled a record that has been described as "awesome." He played 66 games, scoring 888 career points, an average of 13.5 points per game. During his senior year, he scored 372 points in 18 games, averaging 20.7 points per game, the fourth-best score in his state class. Lopez, who has two brothers and one sister, is the only deaf person in his family. When he was two years old, he was deafened by illness. He began taking shots, while lying down, at a Nerf basketball hoop hooked to the end of his bed He became good at it, and moved on to bigger challenges, learning to play regular basketball and making long shots—one of his specialties. After his parents, Crystal and Al Lopez, moved to Denver, Lopez enrolled in CSDB as a 7th-grader. He appreciated the easy communication, made friends easily, and gained a mentor, Joe Manson, his residential supervisor, who became his basketball coach. He	worked	diligently	to	improve	his	skills. His favorite subject at CSDB was science. Now tha he's graduated, he plans to attend Gallaudet University. Of his future, he's said that he'd like to return to CSDB as coach or Athletic Director.